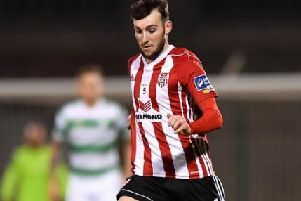 DERRY CITY threw away a two goal lead at Brandywell Stadium to hand Shamrock Rovers the upper hand in the race for the third European spot. Ronan Curtis’ two minute brace in the first half had put the Candystripes firmly in the driving seat and in control of this tense encounter. However, Gary McCabe got one back just before the interval and Stephen McPhail’s free-kick somehow found its way through a body of players and into the net to break Derry hearts with seven minutes left on the clock. The draw ensures the Hoops remain in third spot, one point ahead of Derry with just four games left. Curtis had put City ahead with the home side’s first effort on target on 17 minutes - his first goal since netting in the 3-0 win against Rovers back in April. Conor McCormack found the Donegal man lurking on the edge of the box and he curled his shot beautifully into the far corner of the net. And just 70 seconds later the winger added a second when he got onto the end of Barry McNamee’s fizzed cross and Murphy could do nothing about Curtis’ close range shot as he blasted it into the net. Rovers got back in the game on 39 minutes when McEneff’s loose pass was intercepted 25 yards from his own goal and when Sean Boyd played McCabe into space the midfielder blasted into the top corner from 18 yards. Gerard Doherty then made a superb one handed save at full stretch to deny David Webster’s powerful header from McPhail’s corner on 77 minutes. Against the run of play the Dubliners got back on level terms with six minutes left on the clock when McPhail’s inswinging free-kick from wide on the right crept over the line through a body of players. Derry City - G. Doherty; C. McDermott, N. Vemmelund, M. Karner, D. Jarvis; L. Schubert ( H. Monaghan 71), C. McCormack, A. McEneff, R. Curtis (N. Boyle 86); B. McNamee; R. Patterson; Subs Not Used - S. Patton, K. Ward, J. Daniels, C. Castells. B. Doherty. Shamrock Rovers - B. Murphy; S. Madden, S. Heaney, D. O’Connor, T. Clarke; G. McCabe, D. Webster, S. McPhail, D. Clarke (B. Miele 72); G. Shaw, S. Boyd; Subs Not Used - M. Quinn, A. Bolger, S. Harnney, J. Doona, A. Dobbs.